The spicy Sichuan classic has been simplified here to include easily available ingredients. Vary the chilli heat levels to your taste. 1. Cook the noodles in a large pan of boiling salted water according to the packet instructions. Drain well. Keep them in a bowl of cold water until needed (to stop them sticking together). Meanwhile, cook the broccoli for 2 minutes in a pan of boiling salted water, then drain and rinse under cold water. This stops the cooking process and preserves the colour of the broccoli, keeping it crisp and bright. 2. Whisk the soy sauce, tahini, and cornflour to a thick paste, then whisk in the sesame oil, chilli oil, balsamic vinegar, sugar, and stock. 3. Heat the sunflower oil in a large wok and stir-fry the garlic and ginger for 1 minute, until it starts to colour. Add the pork and stir-fry over a high heat, breaking it up with a wooden spoon, until it browns. Add the sauce and allow to boil for about 2 minutes, until it thickens. 4. 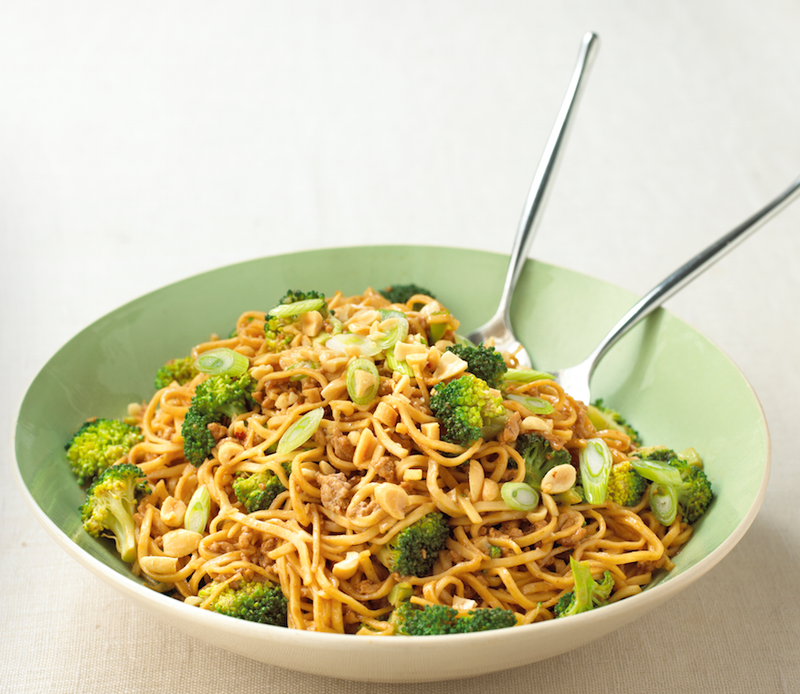 Add the drained noodles and broccoli, stirring them well to make sure they are well coated with the sauce and heated through. Serve scattered with the spring onions and peanuts, if using.